Elsie Freund started designing and making jewelry in the early 1950s, working primarily in a small home studio. 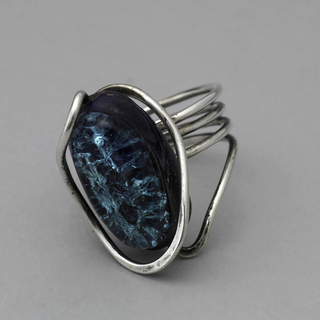 Many of her works, like the ring, were fashioned by from hammered silver wire. Although she did not received much in the way of national recognition in the 1950s and 60s, she did have an important influence on jewelry designers of the next generation. Her work was shown at the 1965 exhibition, "Art of Personal Adornment" at the American Craft Museum. We have 6 objects that Elsie Marie Bates-Freund has been involved with.